Speech to Advance Financial addressed skills for success in leading a balanced lifestyle. Mikki Williams with Advance Financial owners Tina and Mike Hodges. Mikki’s insights and dynamic personality inspired us all to see our potential to become the best versions of ourselves. 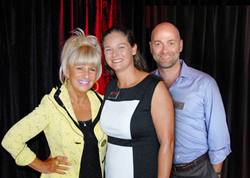 Global celebrity speaker, author, radio and TV personality Mikki Williams, CSP, CPAE stopped in Nashville on Wednesday, July 12, to inspire the team at local financial services company Advance Financial. Williams shared her “uniquely unordinary” perspective on laying the foundation of attitude, humor and enthusiasm and establishing goals and self-management techniques, among other topics. During her speech, Williams outlined key skills for success that lead to a balanced lifestyle, including gaining a clearer understanding of yourself, how your value system has shaped your attitudes and behaviors, and nurturing self-esteem in yourself and others. She introduced the team to “The Honker Habit,” which is the bad habit of just honking your horn when something goes wrong, instead of getting out of your car and doing something about. This experience is just one of the many growth opportunities that Advance Financial works to give its employees every year. By giving a world-class experience to its employees, the company knows they will pay it forward and deliver a high-quality experience to their customers. Advance Financial, founded in 1996, is a family owned and operated financial center based in Nashville, Tenn. The company currently operates more than 80 locations throughout Tennessee and employs more than 800 local representatives. By focusing on a wide variety of financial services – including wire transfer, bill payment, unlimited free money orders and FLEX loans – they are committed to building long-lasting, strong relationships with every customer. Advance Financial recently earned an A+ rating from the Better Business Bureau and was named to the Inc. 5000 list of the fastest-growing private companies in the country for the fifth year in a row.